he Ageas Bowl cricket ground and 171-room Hilton Hotel was officially opened in July 2015 by Catherine Zeta-Jones. The Media Centre and Sky Sports camera gallery glazing design was completely bespoke and engineered entirely by IQ Projects with 20m of frameless structural glass and frameless sliding glass doors on multiple levels to create a frameless glass facade. The frameless interior system allows the façade to slide away for a clear camera shot of the sports ground below. The hotel has eight different meeting rooms and also hosts the largest ballroom in the region, holding up to 700 people, other facilities include the first UK Hilton Eforea spa. 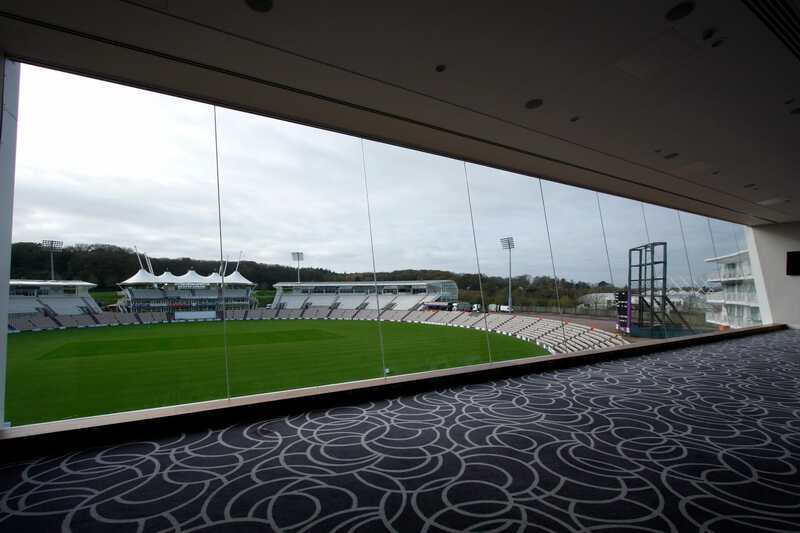 The 20 meters of frameless structural glass was a key design feature with the hotel overlooking the Ageas Bowl cricket grounds, where seamless views were desired. The glass used in the media centre on the lower floor was toughened fixed glass whereas the Sky Sports camera gallery on the top floor had the glass panels fitted into roller carriages to create frameless sliding glass doors so that the panels can be moved to create an opening for the cameras. The floor-to-ceiling glass frameless glass façade offers spectacular views overlooking the picture-perfect Ageas Bowl and the surrounding woodland behind it. To finish the contemporary frameless glass façade, decorative glass was used to create back painted spandrel panels for a smart design finish.